During winter people who live in the Hida area from ancient times have preserved vegetables in the form of Japanese pickles, because there are no harvests in winter. ‘Tsuke-mono’ means pickles in Japanese. ‘Tsukeru’ or ‘zukeru’ means to pickle and ‘mono’ means food or thing. In Japan there are many kinds of pickles: ones made from Japanese radishes, turnips, Chinese cabbage, eggplants, Chinese cucumbers and burdock root. ‘Tsuke-mono’ acquire a smell from fermentation, so they are also called ‘kounomono (smelly things)’ or ‘oshinko (new smelly things)’. 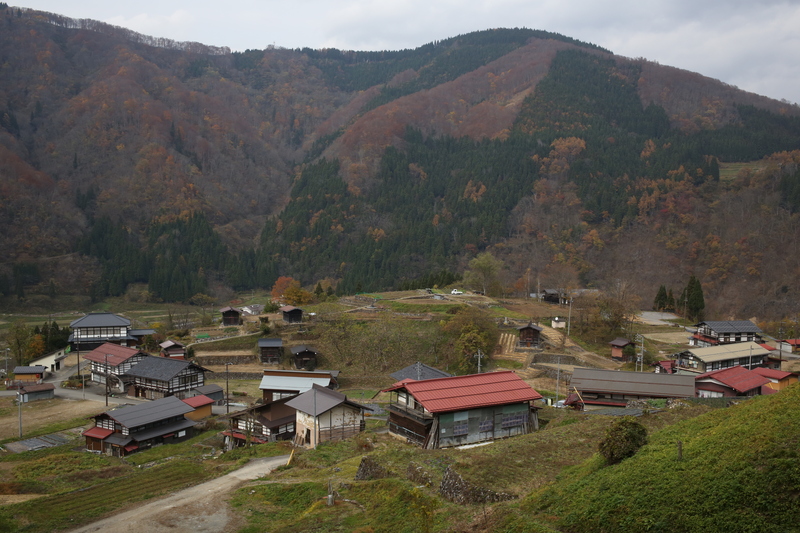 From December to March, in the Hida area, which gets a lot of snow, people cannot harvest any vegetables at all. 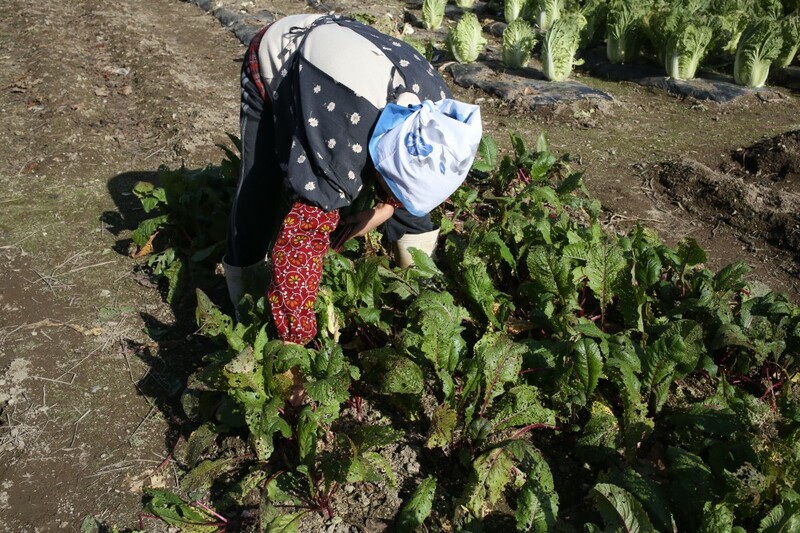 People harvest Japanese radishes, turnips and Chinese cabbage in November, and those vegetables are the last crops of the year. Nowadays, we can easily get several foods through distribution and marketing, and pickles have become like a relish, but until several years ago, pickles were one of the side dishes for rice in the Hida area. Before the winter, people had to make a lot of pickles and eat them every day throughout the winter. Therefore, there was a room for pickles in each house, a room located where it was hard for sunlight to come in. 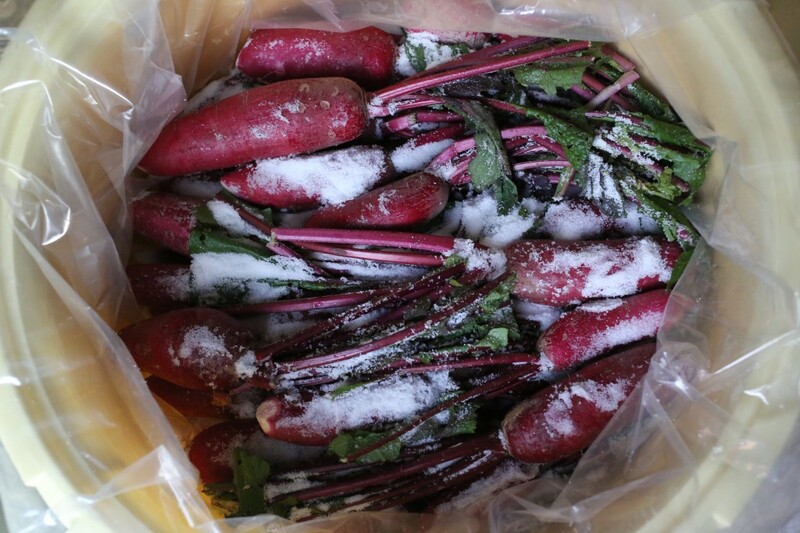 Almost all people discard the fermented pickles in early spring after wintering, but people who live in the Hida area consider it a waste to throw them away, so they cook them for eating. The most popular dish with the fermented pickles is ‘tsuke-mono steak (pickles with ‘steak’)’. Even though it is called steak, this is a vegetarian food without meat. It consists of fermented pickles grilled with eggs and butter on an iron plate. 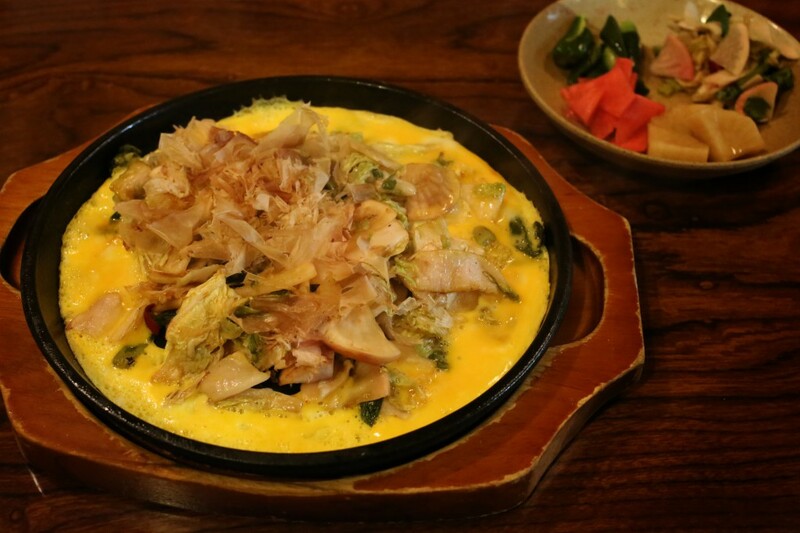 In Japanese taverns, it is a very popular food as a snack. There is one more local dish called ‘Nita-kumoji’. ‘Nita’ in Japanese means cooked or boiled, and ‘kumoji’ means ‘tsukemono (pickles)’ in the Hida dialect. They are fermented pickles made from radish leaves cooked in soy sauce, sweet sake, sake and soup stock. They are also a good snack with sake or rice. Pickles have been cooked in each family, just like miso.”. 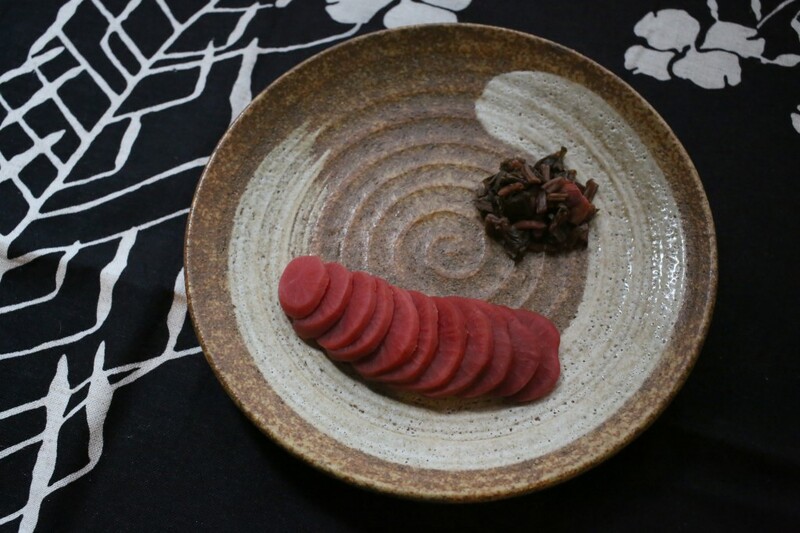 The most popular pickle is ‘aka-kabura-zuke’, which is pickled red turnip. Typically, Japanese turnips are white, but in the case of Hida, the red ones are more popular than the white ones. And,the stalk and leaves of the ‘Tanekura-aka-kabura’ come out reddish, even though the stalk and leaves of the ‘Hida-beni-aka-kabura’ are green. The ‘tanekura-aka-kabura’ are pickled along with their stalks, so in the end they become a brighter and deeper red than other pickles. Their seeds are sown during late August and they are harvested in early November. After being harvested, they need to be washed on that day or the next day and then pickled only with salt. In the village of Tanekura in Hida City, there is a pickle called ‘Tanekura-aka-kabura-zuke’, (made from turnips only harvested in that area). It is said that in the olden days, people did slash-and-burn farming in this area and that it was a good condition for making ‘aka-kabura’. Nowadays there is no slash-and-burn farming, but people continue to make the pickle in a few houses. Ms. Nakatani remarked while staring off toward a far-away mountain, ‘I was told by a mother-in-law that it can be eaten only when the snow on that mountain has melted’. The pickles are the work of the grandmother of the house. It is said that the daughter-in-law is not allowed to help. 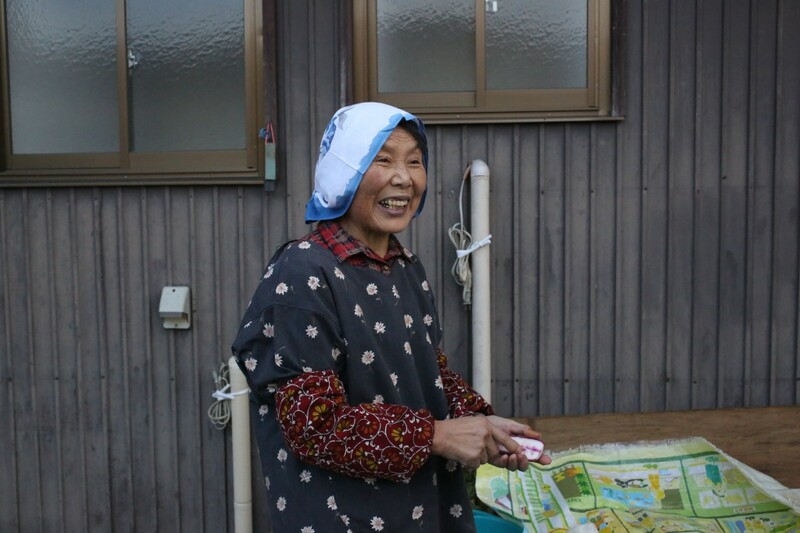 Ms. Nakatani is about 60 years old, and she began pickling ‘aka-kabu’ after her mother-in-law was admitted into the nursing home. In the case of Chinese cabbage pickles, they can be eaten the next day or two days after they have been pickled. 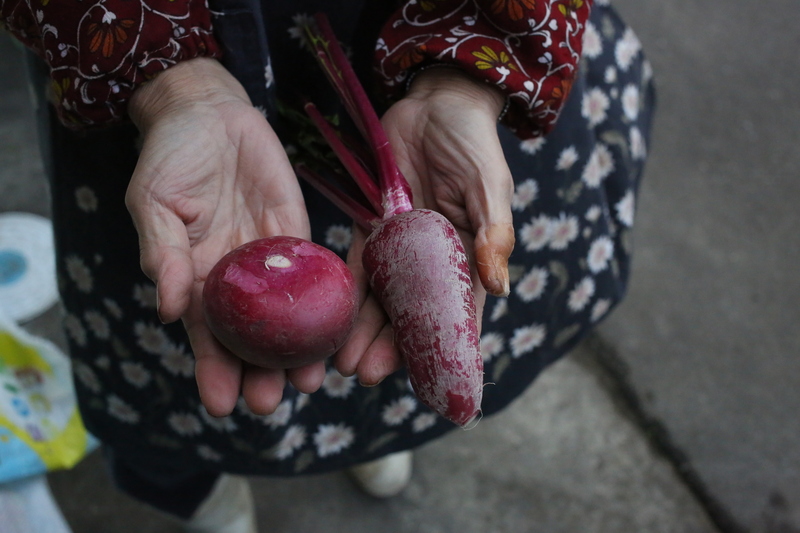 Radish pickles can be eaten two or three weeks after they have been pickled. But ‘aka-kabura-zuke’ can be eaten only three or four months after, they have been pickled. For these people have to wait until early the next spring. They can only be opened to the air once, a week after the start of the pickling. If the pickles are not flat, it is better to flatten them. After that, however, the batch of pickles cannot be opened. On no account should anyone touch the pickling barrel. People cannot taste the pickles until spring, so all they can do is pray that the process will succeed. People don’t use artificial preservatives in making these pickles, so they have to be eaten as soon as spring has come. If people want to keep them longer, they have to be frozen. People have to wait until the coming of spring for the completion of the pickling of the ‘aka-kabura-zuke’. This kind of wait is not convenient for people of the present time, but natural processes take their own time and shouldn’t be hurried. ‘Aka-kabura-zuke’ make use of nature’s color without a need for artificial coloring. It is a color that is pleasing to us. In each area of Japan you can find regional foods like these pickles that may be the good taste of mother’s home cooking.